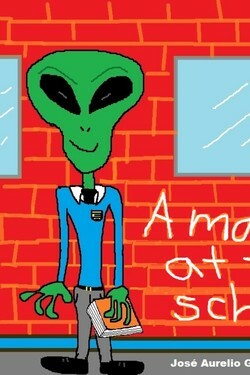 A martian child travels to the Moon and begins studying at a new school. At first, things with his little classmates will get hard, but he will find how to keep safe. This tale talks about the discrimination topic. - You will make many friends! Don´t get the teacher angry! I'll come for you later! - She said, before continue driving the car. Pep walked into his new school, carrying his backpack dangling from his back. The schools of the Moon were very different from those on Mars: everything was smaller. Everything. - You must be Pep- the principal said, looking up at him-. Welcome! I'll take you to the classroom, so you meet your teacher and your classmates. When they reached the classroom, the door was too small, so Pep had to crawl until he could get inside, and when he was inside, he stood and his head hit the roof, and then, the Selenite children laughed. - Stop laughing!- the principal said -. It´s normal that he had hit the roof. Pep is your new classmate and he comes from Mars. Everything is bigger there. Isn´t it, teacher? - That's right, children. On Mars, things are bigger than on the Moon, and naturally, Martian children are bigger than the Selenite children. Welcome, Pep! - "Hey, watch out!" "Ouch!" "You already crushed my lunch!" "Look where you're going!" "You're pushing me!" When he finally reached his desk, he tried to sit on it, but it was so small that couldn´t do it. He continued trying to sit, despite the mockery of his classmates. The small desk couldn´t resist Pep's weight and broke, causing him to fall face down on the floor. The Selenite children laughed very loud. Because there weren´t desks of the Pep´s size, he had to sit on the floor and watch the class from there. - Open your History book on page twenty- the teacher said. Because Pep didn´t has the book yet, the teacher asked another child to sit next to him, so they could read together. - I don´t want- the child said. - Why not?- the teacher said. - Because he's a giant and I'm afraid he will crush me. He already crushed my backpack with his foot. I don´t want he hurts me. - None of that will happen. Do as I say or you will be punished at the Principal´s Office. The child went with Pep, reluctantly, and shared his book. It was small, as his letters, so Pep couldn´t read anything. - What does the book talk about?- Pep said to the child. - Read it- he replied. - I just can´t. The letters are very small. - You have big eyes, they are bigger than my head. How is it posible that you can´t read them? - I know, however, I can´t do it. - Teacher, the green giant can´t read. I think he needs glasses- the child said and the others laughed. - How is posible that you can´t read? Do you know the Selenite´s language?- the teacher said. - I know it - Pep said-. It's just that the letters are very small. - I understand. Well, leave the book then. We'll find something you can do instead. Pep spent the rest of the class sitting on the floor, doing nothing, just watching how his classmates were working. The school´s bell sounded and the children left the classroom to go playing in the schoolyard. His small, white and brilliant bodies were running behind a ball. Pep wanted to join the game, but his classmates didn´t let him. - You're too big and clumsy to be playing with us- one of the children said. - Sure, and you're green too. That´s a horrible color. Get away and let us play- another child said. The principal listened all the conversation, went to his office, took an old ball that had kept and looked for Pep. - Stop crying, Pep. Take this, I give you this ball - the principal said. Pep took it, thanked him, wiped his tears and started to play. The ball looked so small next to Pep, it looked like he was kicking an orange. He was alone, in a corner of the schoolyard, kicking the ball. The bell sounded again, indicating the end of the break, and the students returned to their classrooms. - Children, today we´ll explore the Earth. We'll be there for two hours. We´ll live one of the terrestrial habits called "Halloween"- the teacher said. The children got excited. They enjoyed to visit the Earth. Pep had never been at that planet, so he did´nt know what to expect from the travel. The teacher looked at her wristwatch, touched some buttons on it, and a hole opened on the blackboard. - Hurry up, children, the wormhole can only open for a few minutes! The children got into the portal, one by one. - Come on, Pep, hurry up!- the teacher said. - I'm too big, I won´t be able to fit into the hole- Pep said. - Of course you can do it, you´ll see! The teacher held the hole at the ends and began to stretch it until make it huge. - Do you see? Now, come in. It's about to close. Pep got into the portal and the teacher followed him. At the other side, the other children were waiting for them. They appeared in the middle of a city. It was night at the Earth. - As you know, today is Halloween on Earth. Earth children disguise themselves and ask for candies at the houses. We´ll mix with them and walk into their streets- the teacher said. They waited until a group of earthlings appeared. At last, one group were near of them: they were disguised like zombies. - Hello, earthlings children! We greet you. We come in peace. 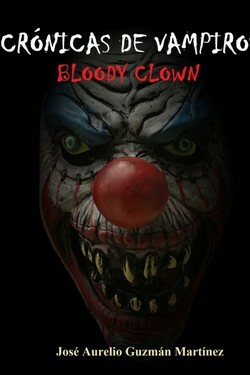 We want to go with you on this Halloween night. - What are you disguised up about? - one of the earthlings said. - We are Selenite- the teacher said. - Selenites. People of the Moon. - I didn´t know that are people at the Moon. - Well, there are people. - Aren´t you too small, like to come from the space?- an earthling children said, showing that the Selenites reached them until the waist. 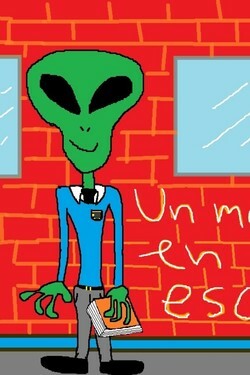 - Selenites aren´t small, earthlings are very tall- the teacher said. - All right, come with us. I like your Selenite costumes. They're brilliant- another earthling child said-. And that child, what is his costume about? Is he a Martian? - Yes, I´m a Martian- Pep said-. How did you know it? - It´s too easy. You are tall, thin, green and you have large black eyes, just like the aliens on TV. Everyone knows how the Martians look like. It´s a good disguise, it seems very real. So, earthlings, selenites and a martian, went together to ask for candies, house by house, and wherever they went, people always congratulated Pep for his "excellent disguise." - "Where did you buy it? ", "You look amazing", "Can I take me a picture with you?" – those were some of the comments that Pep received. By the time they finished touring the neighborhood asking for Halloween, Pep was who had received more candies. He had received so many, than he almost couldn´t carry them and the bags started breaking, so, he gave half of the candies to his Earth friends, who said him goodbye and went away very happy. Although the selenites had also received a lot of candies, Pep still had many more, and that made them sad. - Why does the Martian have more candies than we? - a selenite said to the teacher. - Why do you think that happen? - I don´t know. We are bright and he is green. I don´t understand it. Besides, he is clumsy, strip and breaks anything that he touches. - He isn´t clumsy, he is just different than us- the teacher said. We still having some time left. Would you like to visit more houses before returning? We could get more candies. - No, the Earth children will give the martian almost everything again- a selenite said, sobbing. - This time it´ll be different. I promise you - the teacher said. Later, when they returned to their school, through the wormhole, they all was carrying bags and bags full of earthlings candies. They were happy, especially Pep. Now the selenites were fighting to be at his side. They had so many candies, that they distributed them among the rest of the students of the school. Because Pep was bigger than the other children, he was able to carry more candies and distribute them faster among the selenites: "Here, Pep, over here! ", "Thanks, Pep! ", those were some of the words listened at the schoolyard. - Earth candies are delicious. How did you get so many? - a selenite sucking a lollipop said. - It was very easy- the teacher said, at the same time she was cleaning with a cotton, a green stain on her arm- . We disguised ourselves as martians. JOSE AURELIO GUZMAN MARTINEZ José Aurelio Guzmán Martínez. Nació en México. Escribe cuento, novela, poesía y teatro. Ha publicado en diversos medios impresos como El Sol de San Luis y La Gaceta del Fondo de Cultura Económica. Entre sus premios más importantes están: - Premio Nacional de Poesía "Xochipilli Macuilxóchitl" (1997). - Segundo Lugar Nacional del Concurso "Terminemos el cuento..." (1997). 1.- A martian at the school Dec. 18, 2018, 6 a.m.